Levangie has given us a fresh new voice in her narrator Perry Gonzales. The book is written as a college entrance essay (albeit a lengthy one). Perry, still in 8th grade, is the center of a bizarre hurricane. She is the recipient of a scholarship to a very exclusive and very expensive private academy. In no way does she belong to this world of Beverly Hills elite. Her mother (single) works hard as a nurse. Perry gets good grades, is older than her years would suggest, and she certainly has a personality that outstrips the usual “mean girls” persona. Perry tells the stories of classmates, students she is tutoring, and the siblings of various entitled brats. Each one is a demonstration of one of the deadly sins, lived out. In such a shallow setting, with such an astute narrator, it’s not hard to find examples. There is an aspect of Roald Dahl to Perry. She is unflinching in her assessment, but only after she attempts to help the sinner. This is our introduction to the Blogsnots, and Perry. Here is how she describes one of her pupils, Timmy. Timmy didn’t bother taking off his 3-D glasses as he shifted and writhed and gave up trying to get off the couch to greet me. He then struggled to raise his hand to shake mine. When our hands finally met, I was horrified to see that his thumbs were the size of large turnips — they were thick and bulbous. A metallic sound came out of his body — his version of grunting a hello. I was scared that perhaps he was unable to form a sentence. I knew he was close to twelve or thirteen, but it was hard to tell what age he was, he appeared so wan. ~Pg 122. Reminiscent of Augustus Gloop, no? 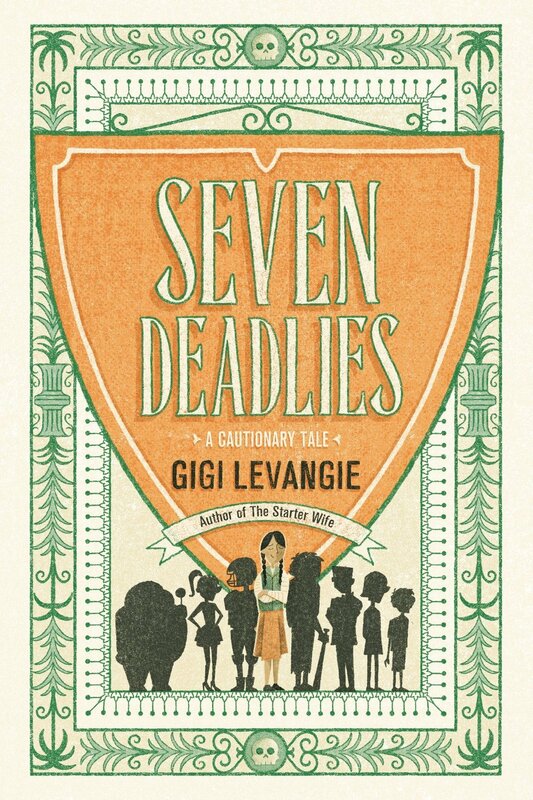 The Seven Deadlies is a quick read and incredibly delightful. But despite its light-hearted demeanor, there is a lesson to be had. These are modern fables. By positing the most extreme case, the reader is able to laugh at the story, even though there is a moderate kernel of truth in it all. The book is compact, but thorough in its wisdom. Although this is neatly tied together in the end, I do hope we can hear from Perry Gonzales again. Many thanks to Blue Rider Press /Penguin for the review copy.